Why is iPhone so destructible? It's the question I keep asking, wondering whether to blame the device or my daughter. Last night, she texted: "My screen cracked again. I'm so sorry". That's the third shattered iPhone 5s since May; two 5ers busted before that. Clearly, she's fumble fingers, but something just doesn't seem right. The college student sticks the damn device in a protective case. Did Apple put pretty design before damage durability? I spent several hours searching for smartphone breakage data today -- on the web and contacting several sources compiling stats. Strangely, the most compelling comparisons are years old. For example, in late 2010, SquareTrade reported that iPhone 4 accidents exceeded the 3GS and devices from competing smartphone manufacturers. 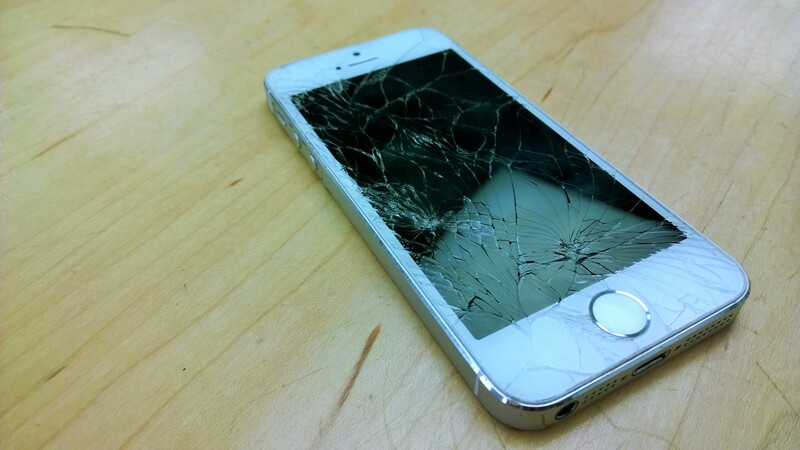 In a 2012 survey of 2,000 iPhone users, 30 percent had damaged their device in the previous 12 months. Today, the mobile insurance provider uses a different methodology: Scoring smartphones on a 1-10 scale based on hands-on durability testing. Best mark goes to the Moto x, with 4.5 (lower number is better). By comparison, iPhone 5s is 5.5, or half-a-percentage point higher than its predecessor. iPhone 5c is even less durable, rating a 6. On the reparability front, iFixIt ranks iPhone 5s a six out of 10 -- same as iPhone 4 but one-ranking less than the 5. Perhaps that's why Apple could replace the screen on my daughter's busted 5ers, but the store Genius said swap-out was the only option for the 5ses. By the way, Motorola Droid Bionic and Atrix 4G get the highest repairability marks: 9. I bought my first cell phone in 1997 from Bell Atlantic, which later became Verizon. The Qualcomm-branded brick phone was built like one. Here's a true story: The following year I replaced the Q phone with something trendier, and it stayed in a box until I cleaned out the basement in 2007 -- right before moving to San Diego. Out of curiosity, I hit the power button and the phone started up with half-charge. After nine years! The battery wasn't dead. They don't make `em like that any more. Knock on wood, I've never broken a mobile and haven't dropped a smartphone in years. I don't use a protective case, either, just a belt-clip holster to carry the device. So my daughter's dropping dramas are rather perplexing. She uses iPhone, as I have in the past. Most recently: Nokia Lumia Icon; various Androids before it. The teenager busted two 5ses on T-Mobile, and I sold the last replacement when switching to Verizon a few weeks ago. I pay $99 extra for AppleCare+, which allows up to two replacements for $79 each, on every iPhone. (The price is $49 for devices purchased before September 2013.) If no replacement ever occurs, my experience: The warranty increases the iPhone's resale value. Strangely, while double-sided glass made iPhone 4 and 4s conceptually more vulnerable to shatters, my daughter dropped but never seriously damaged either mobile. There were scratches, dings, and even chips, but no shattered glass. But, woe be iPhone 5 or 5s. She's in college now, and someone is sure to blame alcohol. That appears not to be a major factor. (Hey, what parent really ever knows?) Like many other young women, she carries her iPhone in a back pocket. One shatter occurred when the device popped out when she sprinted to get to the security gate on her apartment before it closed. Last night, I ordered a tougher case from Amazon -- the OtterBox Commuter Wallet. My daughter prefers not to carry a purse, keeping bankcard and license (or student ID) with the phone. Amazon is something else. I ordered around 9:30 p.m. local time and had delivery today. The replacement iPhone will go into the OtterBox, after my daughter returns from a weekend concert. Assuming the device doesn't die. She used the last busted 5s for a month before we moved to Verizon, despite glass shards chipping off. My local Apple Store recommends LifeProof cases, but I found no card-carrying model and am more familiar with the other brand. My hope is that the follow-up story to this one will be months away, with the OtterBox case protecting the iPhone 5s from the daily dings and drops of active college life. But being five breaks for 5 (or 5s) in 14 months, optimism escapes me.